When you smile, do you only see what isn’t there? Do you think whenever you speak that everyone’s eyes are instantly drawn to the gap in your teeth? If you’ve ever had these thoughts, Dr. Thomas Meschke and Dr. Aaron Swingdorf can give you your teeth back and make your smile look even better than before. The next conversation you have can start the right way, and that’s with confidence. Your self-image can quickly be restored with a fixed-bridge in Chaska. It is a small, natural-looking restoration that instantly and comfortably fills in the gaps in your smile. In addition to making you look and feel better about yourself, they also help your mouth functionally. Missing teeth can often cause the remaining ones to crowd and become misaligned, which can lead to unconscious teeth grinding and chronic pain. A fixed-bridge can correct all of this at once with a simple solution you can start getting today. It starts with two supporting crowns that are bonded to your teeth adjacent to the space in your smile. These will be used to support one or two prosthetic teeth that sit on top of your gums, “bridging” the gap. These prosthetic teeth will blend seamlessly into the rest of your smile, and feel like they’ve always been there. Each fixed-bridge is custom-made for every patient to give them the best balance of both functionality and aesthetics. They work so well, in fact, that after a few days, most people do not even notice them. Unlike other tooth replacement options such as dentures and dental implants, fixed-bridges require a minimal amount of time. The only thing you need to be a good candidate for one is enough healthy dental structure around your missing teeth to support it. 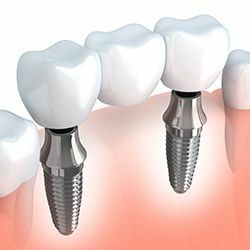 If you don’t have enough, dental implants can help provide it. 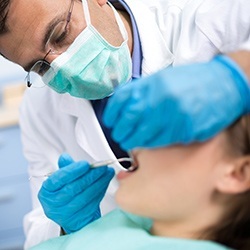 One of the doctors will examine your mouth and gums to make sure a fixed-bridge is the right solution for you. If it is, he will begin by preparing the supporting teeth so they can fit the crowns that will hold the fixed-bridge in place. 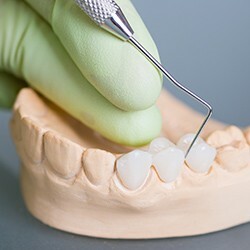 He will take an impression of your teeth and send it to a local dental lab to design and fabricate your fixed-bridge. Finally, you’ll return to the office to have the bridge placed in your mouth. The procedure is completely painless, and it usually only takes two weeks for your fixed-bridge to be made. During this time, you’ll wear a temporary one so you can be assured that even after your first visit, you will have your teeth back. Once your fixed-bridge has been placed, the doctors will instruct you on the best way to take care of it. 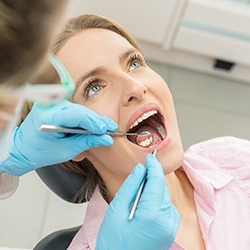 Maintenance is very straightforward, as regular brushing and flossing are all that is needed to keep it looking like new. This will help it, along with your new smile, last for decades. Getting a fixed bridge is simpler than you might think, and you can start treatment as early as today. You can keep worrying about your incomplete smile and wait for your teeth to slowly become crooked and painful, or you can start getting a fixed-bridge today. Which sounds better to you? You can finally get your confidence back, and that’s truly priceless. If you would like to learn more about fixed-bridges or want to schedule a consultation today, please give us a call.